Presenting Your Pacific Rumble Champions! 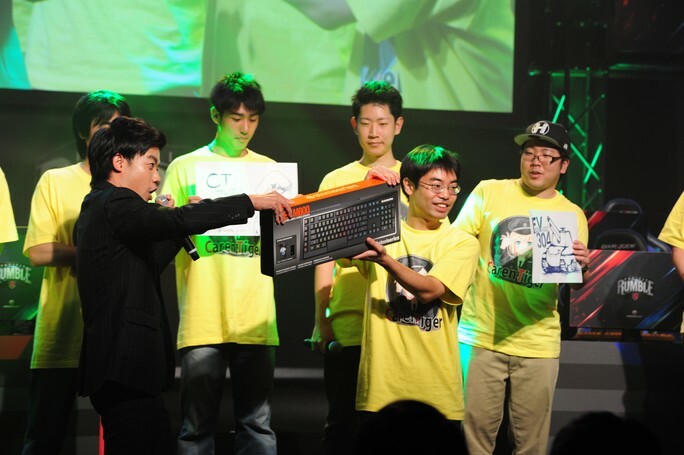 Congrats to EL Gaming! 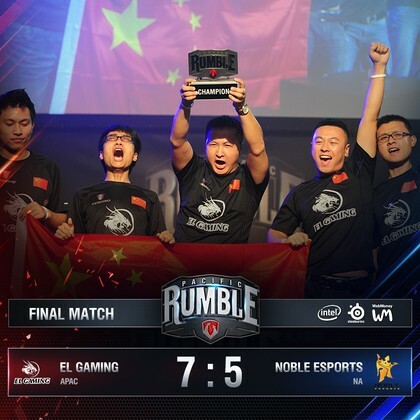 The superstars of the Asia server have shown once again why they truly are the champions of APAC with a resounding 7-5 win over runners-up Noble eSports, taking home both the top prize of $45,000 USD and the champion’s crown. See what went down at this ground-breaking mega-event in the short recaps below! A closely-fought battle that saw both these great teams go toe-to-toe first on Himmelsdorf, then on Lakeville. 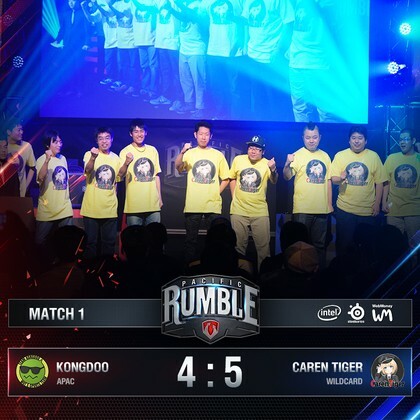 Home team Caren Tiger played much more conservatively this time than they did in the recent Season I Finals, and managed to pull off a rather impressive victory over KONGDOO on tie-breaker map Mines. 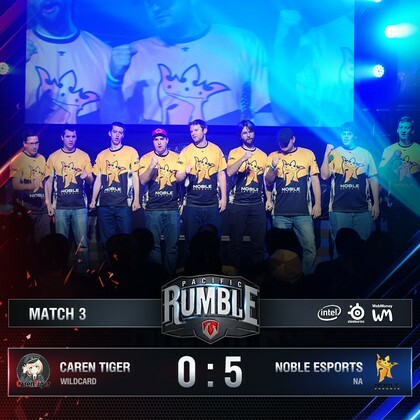 Excellent performances by EL Gaming and High Woltage Caballers! The speed and aggression of both teams, backed up by the in-depth map and strategic knowledge that it was clear each of them possessed, made every one of their matches a swift and decisive affair. Perhaps Caren Tiger would have done better to ban Steppes, one of Noble's stronger maps, this time round. It was clear that Noble's recent WGLNA title was well-deserved - they swept through each match without mercy, felling CT's tanks left, right and centre. CT fought back valiantly, but it was Noble who eventually made it to the Finals. The comeback of the night was definitely Noble's. From a bleak 6-2 scoreline, they were able to claw their way back up, interrupting EL Gaming's massive win streak. That wasn't enough to bring EL down, though - EL quickly regained control of the map after an initial Noble advantage on their last match, and decimated the remainder of their opponent's forces with ease. 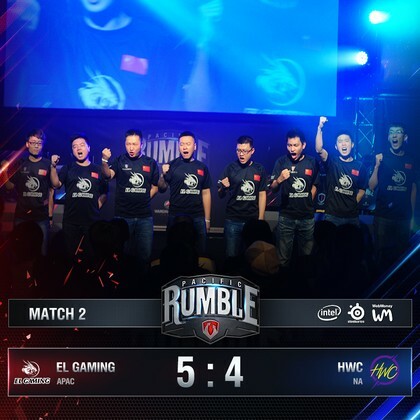 Congrats to EL Gaming, this year’s Pacific Rumble champions! To celebrate an APAC victory and to honour the teams’ excellent performance at The Pacific Rumble, we’ll be having a special mission so that everyone can share in the joy! Mission: Champions of the Rumble! Place in the Top 10 XP earners on your team in battle. An honourable mention goes out to Caren Tiger - they received a special Steel Soldier Award presented by Steel Series for being the Attacking team that achieved victory in the shortest amount of time. Congrats to them, and well done to all our Pacific Rumble teams!